In October the City of Kingston approved a new Kingston Electric Vehicle Strategy. This document lays out a series of actions Kingston will take to reduce the council’s own transportation related green house gas (GHG) emissions and how they will help citizens and visitors do the same. We have an interest how Kingston does this besides as a good example for the City of Ottawa to follow. We lived in Kingston for several months in 2015 and 2016 preparing for our trip south on Kinship and we have a son studying at Queens so we visit several times a year. Kingston is going to start with their fleet of cars and light commercial vehicles. This a natural outcome of the current pricing and incentives available. As older vehicles in this class come up for replacement, they will be replaced with EVs and Level 2 chargers will be installed. Later transit buses and other vehicle will come into play as options become available. The City of Kingston is a member of the Canadian Urban Transit Research & Innovation Consortium (CUTRIC) A consortium exploring options for electric buses in Canada, starting with a pilot project in York Region I suspect that Kingston will find that buses are available today that can meet their requirements. Kingston has only a handful of charging stations today, although it is worth pointing out that on a per-capita basis they have more stations than Ottawa. 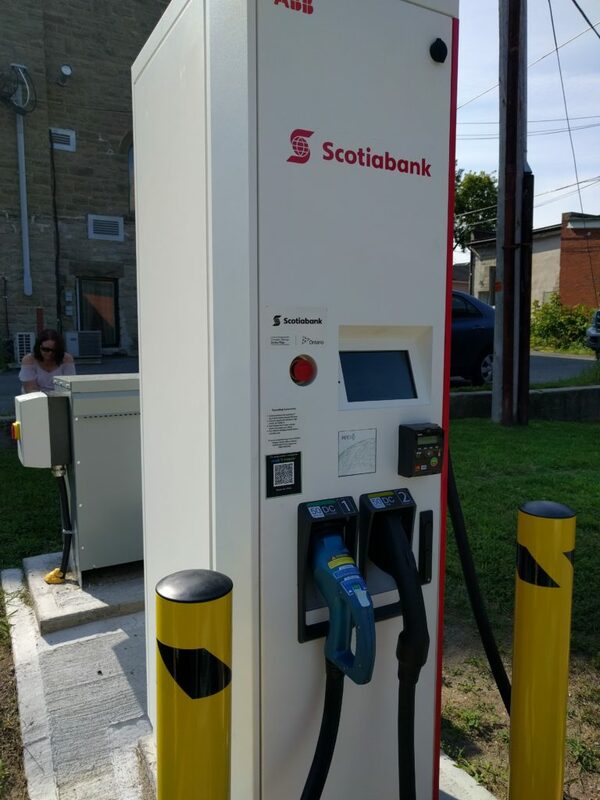 Kingston is going to install 2 DC Fast Chargers and 25 dual level 2 AC chargers across the city. This network will allow visitors and locals to charge in many handy locations. There is a certain amount of “build it and then they will come” here, but the plan is sound and it will draw EVs to downtown which is under served today. As visitors this is great for us, we have to charge in the West end today, well away from Queens, downtown and where our son lives. Charging will be free at the Level 2 stations, the DC stations will be in the $10-15 range. 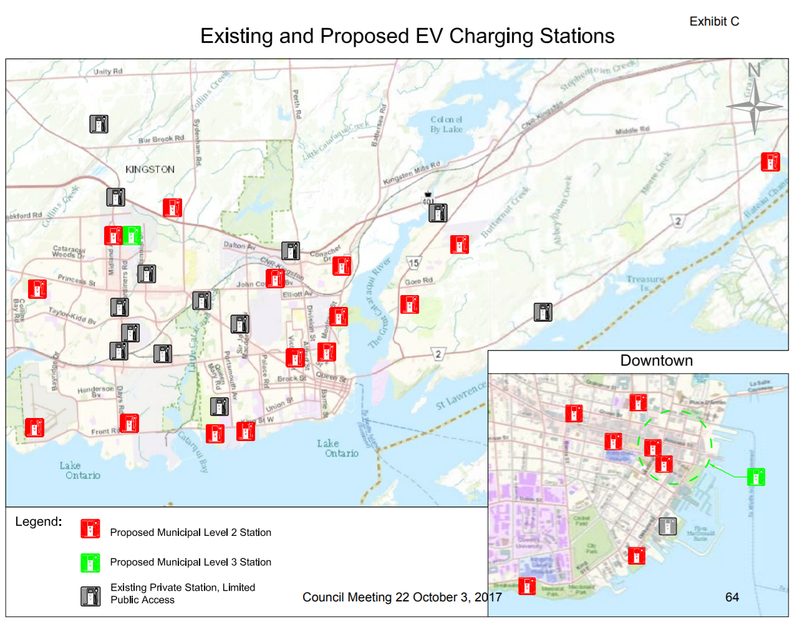 Kingston is also working on preparing the grid and having EV charging as an integral part of new builds for the City. This target area is weaker than the other area, the City is planning on installing chargers for employees if there is demand. For many Cities this is an area with real impact, hopefully Kingston will follow through on this. Kingston’s initial capital investment in these programs is $796,000, representing 0.15% of the total 2018 budget. If Ottawa was to allocate the same percentage we would be looking about $5,000,000. Kingston is to be congratulated on their commitment, I will look to 2019 to see how their bus fleet electrification progresses. Kingston spend about $82,000 per year supporting the operation of the chargers with cost reductions from fees reducing this over time. 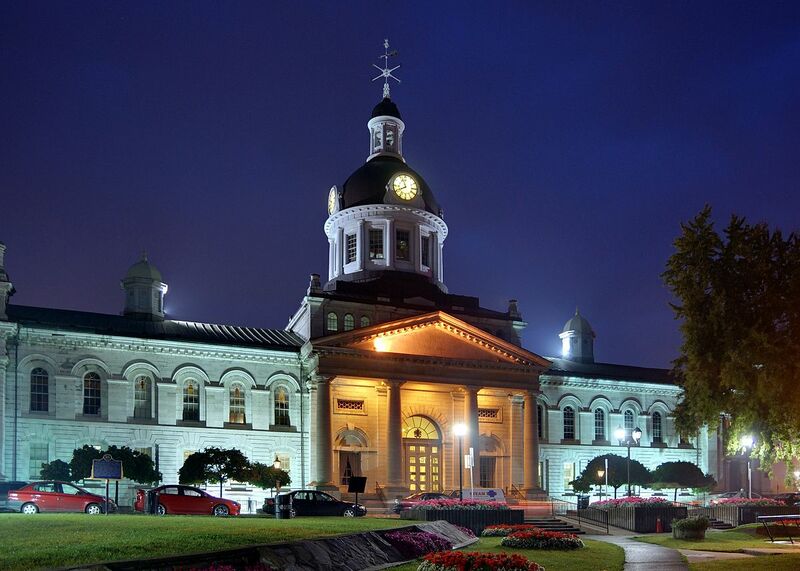 Using Kingston as a model is certainly valid for small-medium municipalities in Ontario. The current provincial programs support the switch and similar sized cities could implement this strategy successfully. Larger Cities can take much from the strategy, but it would need to be adapted to the larger organisation sizes involved. Kingston is evidence that leadership and a relatively small budget commitment can go a long way to starting the process of reducing the GHG impact in a way that saves money. In the before time, when we still had a fossil car we had a rule, we did not take the car out for one errand. One errand was a walk or a cycle to the closest store, not perhaps the cheapest but we saved on gas to make up the difference. We tried hard to make sure we had at least three errands to do in the same end of town before we pushed another dinosaur out into the atmosphere. When we reached enlightenment with Electric Alice that rule went out the window. With no pollution, low costs and even lower guilt, we were freed to drive whenever we felt like it. In the last couple of weeks and after driving 12,000 km since July, it has become clear to me that this freedom comes at a cost – traffic. Arriving late somewhere we, like most people say we were stuck in traffic, but this a lie, the honest way to phrase this is “we were traffic and traffic was slow”. EVs are great in traffic, quiet, easy to drive and with one foot driving being in traffic is far less taxing than a fossil car. But we are traffic too, we might not pollute but we can contribute to congestion and by the same measure contribute to pollution indirectly. With an EV, the personal cost of being in congestion is reduced. An EV is easier in traffic, and more relaxed generally, so it is more tolerable to sit in a traffic jam. The personal cost gets less as the cars get smarter. Tesla, Nissan and VW all sell EVs that will just follow the car in front in a jam, taking over much of the driving task. If we take this to the extreme with autonomous cars (should this turn out to be possible, more on this point in a later post) the personal cost of traffic congestion is almost completely removed. You could work, sleep, play just as you might on a train. You have to wonder if autonomous cars are going to need a washroom and a club car to be really successful. There is a real chance that the move to more automated EVs will mean more traffic. A lot of the rest of traffic will still be burning dinos, reducing the benefit of electrification through congestion. Fleets of shared self-driving cars, such as Waymo and Uber are proposing would be catastrophic for traffic if they succeed as a large scale replacement for personal cars. Each trip with passengers will require an extra trip for pick up. 50% of traffic from these services will be empty. As a replacement or supplement to transit, the issue of traffic is even worse. 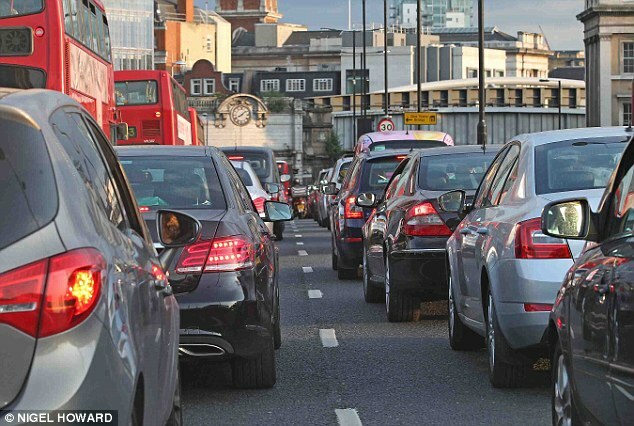 Widespread electrification could impact cities with congestion charges like London. With the current system, EVs are not charged to enter central London, but if significant percentage of all vehicles are electric there is quite the potential for gridlock. Policies will have to be adjusted to ensure traffic can flow and that the streets are not totally given up to cars and trucks, no matter how green they are. Oslo, perhaps the most electrified city in the world will start to charge EVs to enter the city centre as of January. The charge is small (€ 1.1 vs € 4.7 for a petrol car) but will rise again in 2020. So, my plan is to try to go back to the three errand rule, at least when there is a lot of traffic. Walking and cycling are still better for the world, even if you drive an EV. The Government of Ontario has a broad set of policies and programs aimed at promoting electrification in the province. As a user of many of these programs I think a personal review might be of benefit to other users and the managers of the programs. The EVIP is designed to subsidise the purchase of EVs, based on factors such as battery capacity and number of seats, the EVIP delivers an incentive of between $3000 and $14,000 depending on model. We qualified for the full $14,000 and this was processed by the dealer when we bought the car. The incentive brought the price of our car into a similar price range as a fossil car of the same make. By removing the premium for EVs, it allowed us to consider an EV when we would likely not have been able to afford one without the EVIP. As a way of seeding the market and ensuring demand this program has been very successful. It has created long waiting lists for EVs in Ontario and has to be regarded as successful. This has highlighted a lack of effective supply side policy, but I will come back to this later. My personal take on the incentive is I have been paid $14,000 to be an ambassador, I am happy to help promote EVs and share my experiences. But even if other beneficiaries of the program don’t share this view, just by being present on the road shows that EVs are now a normal choice of regular people. The only thing standing between EVIP and an A are the delayed payments. The province did not have enough staff to process the payments quickly and there is a large backlog. Most dealers will not process the incentive on behalf of their customers due to long delays in getting paid. This means that the customer has to pay the $14,000 out of pocket and wait months for the cheque from the province, this reduces the affordability of EVs. I understand that more staff have been hired to process payments. Hopefully this will improve quickly. This is a small program that provides a 50% incentive for both a home charger and the installation of the charger, up to $500 for each. This program is small in value compared to the EVIP but it has some great features that will help grow the EV market. Firstly the incentive is only available for chargers bought in Canada from a Canadian source. Without the incentive I would have saved some money and imported a charger from the US. With the incentive, I used a dealer in Ontario. The Canadian distributors and manufacturers are helped to grow and this will ensure that EV chargers are sold and supported in Canada. This is great choice by the province and means that you can go to Home Depot and pick up a charger just like any other appliance. The program also requires an electrical inspection ensuring that the charger is safely installed. Once again, the only thing reducing my mark is the slow processing of payments, I have yet to receive my payment after 3 months. The EVCO grant program was intended to fund a large role out of Level 2 and Level 3 chargers with a completion date of March 2017. Funding of $19,845,122 is intended to deliver 274 Level 2 chargers and 211 Level 3 chargers. Level 2 chargers are slower chargers and are suitable for sites where users will spend 2-5 hours such as hotels, parking etc, Level 3 chargers are faster and suited to places where the stay is 40 minutes or less and along a travel corridor. Without the EVCO program, long distance travel by EV (other than Tesla) would not be possible at all. The program has problems but these have to examined remembering that there were next to no level 3 chargers on the highways of Ontario before this program. At seven months after the target date of the promised over a third of the chargers have not been delivered. Of the 274 promised Level 2 chargers, 50 are “coming soon”, with no plans for the final 42 and of the 211 Level 3 stations, 24 are “coming soon”, with the final 53 not planned . I think this delay is understandable and forgivable, it is hard to plan a large project like at well over 200 sites, some delay is inevitable. Perhaps less understandable is that 42 Level 2 and 53 Level 3 chargers are not accounted for. It is unclear from the data available if these chargers are in process somewhere or if these are not going to happen. The design of the public network of level 3 chargers has favoured urban and suburban locations rather than the highway locations needed to enable long distance travel. There are significant gaps east and west of the GTA that are not yet filled. There are currently no plans for fast chargers at any of the 400 series highway service centres. However, there are some more critical issues with the program. A large number of the Level 3 chargers that are intended to charge at 50 kW are restricted to much lower power. Koben Systems Inc (KSI) won over half of the available funding under the EVCO program with a promise of 152 level 2 chargers and 126 level 3. Many of KSI’s level 3 chargers are limited to 50 amps, outputting about 20 kW. The time taken to make a trip longer than the range of an EV is highly dependant on the time it takes to charge. Using a charger rated at 50 kW, an EV will extend its range at about 250-280 kph. A charger limited to 20 kW will give about 110-130 kph. 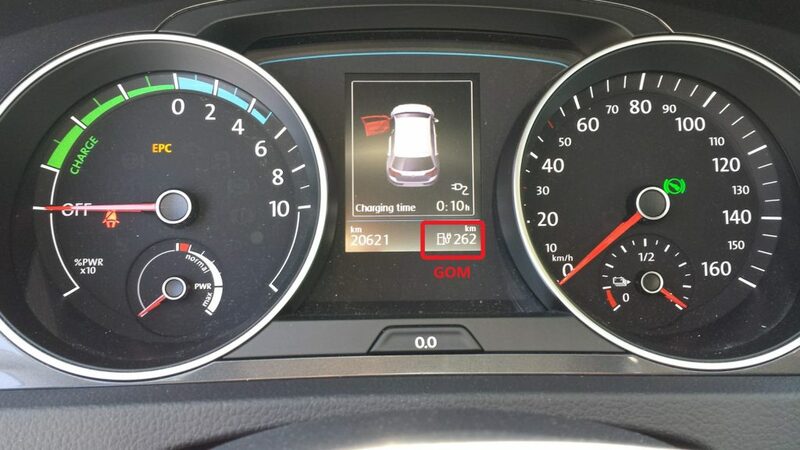 Driving 500 km beyond the range of an EV will take about 2 hours longer using restricted chargers compared with chargers operating at full power. 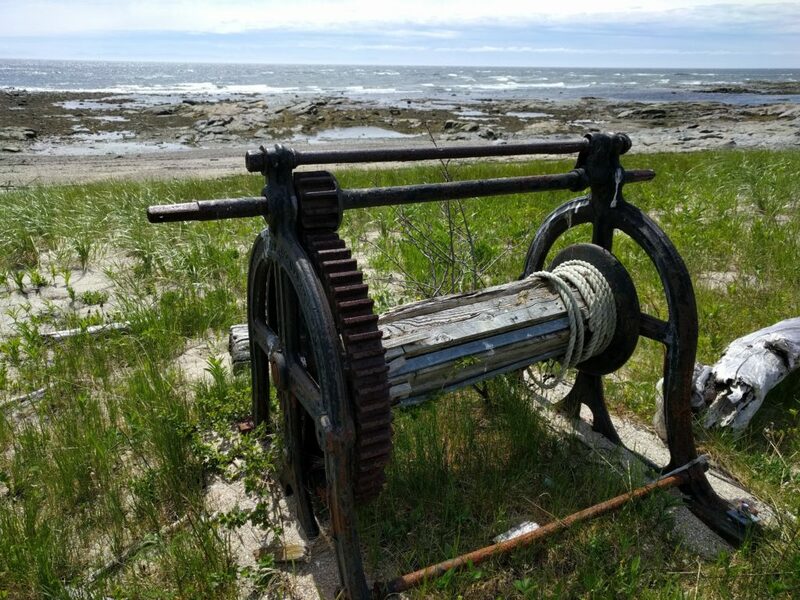 The chargers that are limited share their power feed with the host site and this causes a problem with Ontario’s demand pricing for electricity. Exceeding 50kW even once changes the class of an electrical service, increasing the overall cost of power significantly. It appears that the vast majority of KSI stations are limited to 20 kW (50 amps) and as they are due to deliver 126 of the 211 the negative impact on the public charging network is extensive. With so many of the chargers in the public network unable to deliver a truly fast charge, the prospects for long distance EV travel in Ontario are not good. KSI also has severe support issues. Unlike any of the other charger network, the support line is not answered by someone able to do anything with the chargers. They promise that “support will call back” but it is unclear if they ever do. The Province failed to provide clear specifications for the level 3 chargers and support processes and as a result we are left with a mess, fast chargers that are slow and non-existent support for the majority of the charging stations. 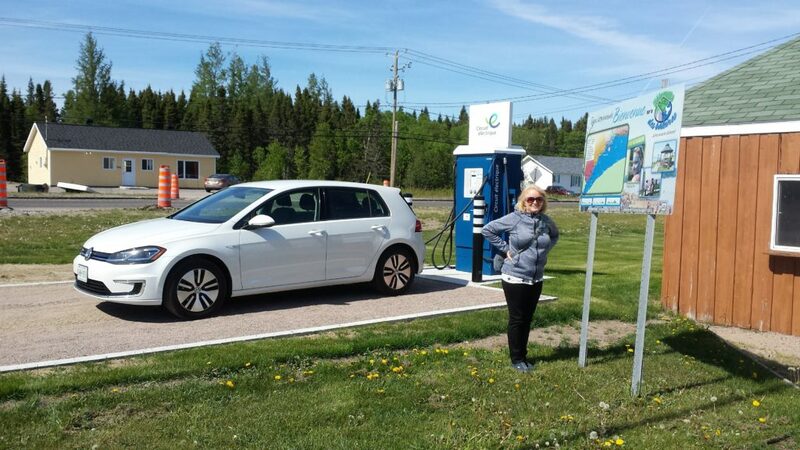 Currently, EV charging stations charge either based on time or a connection fee plus time. This model incentivises lowering the power of a fast charger to increase the time connected and the fees paid for a charge. In my view, the fairest way to charge for level 3 charging is a small, fixed connection charge and then a per kWh rate that is published. EV charging stations need to be regulated in exactly the same way gas pumps are, from a consumer’s point of view there is no difference. For KSI Level 3 chargers the combination of reduced power, their fee structure can push the cost of a charge to double the cost of gas for the same journey. 1 Charging cost based on KSI rates ($4.95 connection fee and $0.20 per minute) on a charger limited to 50 amps. 2 Gas cost based on $1.20 per litre and consumption of 6.5 l/100km. Families with a conventional car in addition to an EV are far less likely to undertake long journeys in their EV if it costs them more and takes them a lot longer due to KSI’s chargers. The EVCO charging network requires regulation and policy changes to move EV long distance travel from possible to the best alternative. Quebec’s network of Level 3 chargers consistently delivers fast charging at a much lower price. A 30 minute charge will deliver 133 km and cost $6 on an Electric Circuit station, 64% cheaper and 100% faster than KSI delivers in Ontario. At this time, the Province is not attempting to manage the supply of EVs in Ontario. There a provision in the Electric Vehicle Incentive Program that each manufacturer must demonstrate a path to raise EV sales to 5% by 2020. However the only sanction is the loss of access to the EVIP, which, if you don’t plan to sell cars, is no sanction at all. Today, EVs from Nissan, GM, Hyundai and Volkswagen are sold out until the middle of 2018, Tesla’s Model 3 first Canadian deliveries are not expected until late 2018. Finding a lower cost EV in Ontario is just about impossible. In 2018 I expect this to get much worse as Quebec has introduced a quota system for EVs that starts in 2018 at 3.5% of all car sales, rising to 15.5% by 2025. This quota has already removed the 2018 Ford Focus Electric from sale in the rest of Canada and it seems likely that Ontario will lose access to other models as the impact of Quebec’s quota system is felt. 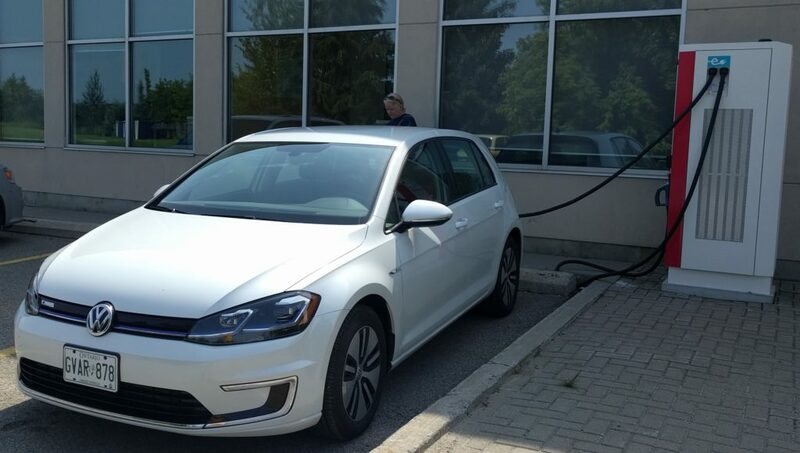 As Quebec pushes forward there is a high likelihood that the shortage of EVs in Ontario will continue for many years, handicapping the Province’s EV programs. There is little point in stimulating demand, as Ontario has done so successfully if there are no cars to buy. 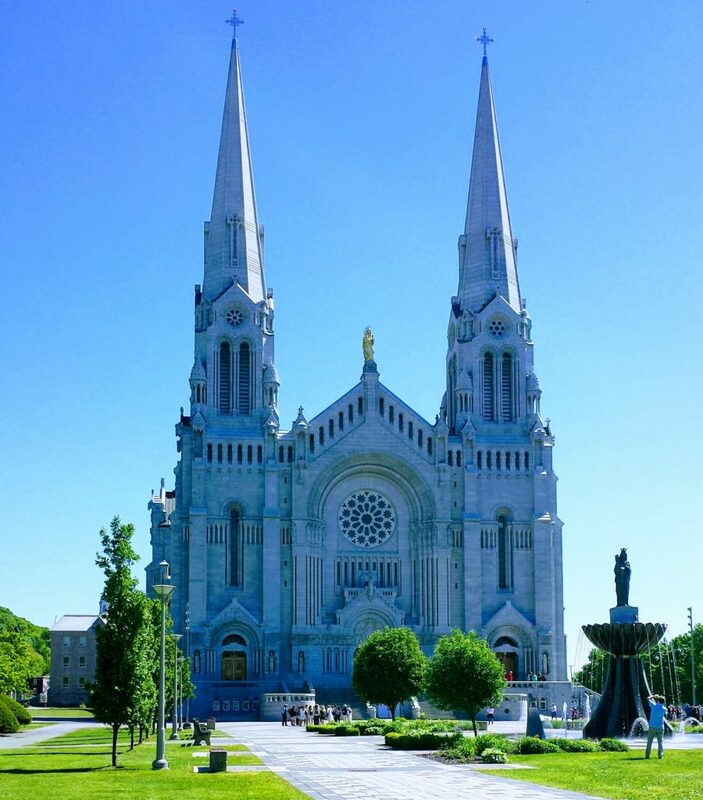 Federal Minister of Transport, Marc Garneau has not indicated any desire to move forward with a national EV quota system, it is left to the Provinces to address this as Quebec already has. The current programs have changed the landscape for the EV in Ontario. By making EV ownership easier and long distance EV travel possible, the Province is to be congratulated. The lack of supply side policy has undermined these successes and in 2018 I expect to see the slow growth of EV sales to continue or perhaps fall back depending on how Nissan and Tesla address the Quebec market. Urgent action is required to address the issues with EVCO and quotas if growth in EVs is to continue.